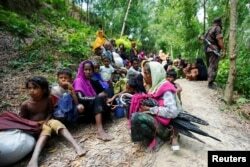 Ethnic Rakhine people who fled from Maungdaw after Arakan Rohingya Salvation Army (ARSA) had attacked, arrive in Buthidaung, Myanmar, Aug. 28, 2017. Myanmar security forces intensified operations against Rohingya insurgents on Monday, police and other sources said, following three days of clashes with militants in the worst violence involving Myanmar's Muslim minority in five years. The fighting - triggered by coordinated attacks on Friday by insurgents wielding sticks, knives and crude bombs on 30 police posts and an army base - has killed 104 people and led to the flight of large numbers of Muslim Rohingya and Buddhist civilians from the northern part of Rakhine state. The Nobel peace laureate has been accused by some Western critics of not speaking out on behalf of the long-persecuted minority, and of defending the army's sweep after the October attacks. The Rohingya are denied citizenship in Myanmar and classified as illegal immigrants, despite claiming roots there that go back centuries, with communities marginalized and occasionally subjected to communal violence. "Now the situation is not good. Everything depends on them - if they're active, the situation will be tense," said police officer Tun Hlaing from Buthidaung township, referring to the Rohingya insurgents. Rohingya villagers make up the majority in the area. "We split into two groups, one will provide security at police outposts and the other group is going out for clearance operation with the military," he said. A Buthidaung-based reporter, citing police sources directly involved in events, said three police posts in northern Buthidaung had been surrounded by Rohingya insurgents. Many houses had been burning since Sunday in parts of neighboring Maungdaw town, another journalist and a military source in Maungdaw told Reuters. A Rohingya villager in the area said the army attacked three hamlets in the Kyee Kan Pyin village group with shotguns and other weapons, before torching houses. "Everything is on fire," he said by phone. "Now I'm in the fields with the people, we're running away." A military source in Rakhine state confirmed that houses were burned in the area but blamed the insurgents, who he said opened fire when soldiers came to find them and clear landmines. The insurgents fled, he said, adding there were no casualties. The Myanmar military reported clashes over the weekend involving hundreds of insurgents, taking the death toll to at least 104, the majority militants, plus 12 members of the security forces and several civilians. There were no official updates from the army or the government on Monday. Rohingya people sits on the Bangladesh side as they are restricted by the members of Border Guards Bangladesh (BGB), to go further inside Bangladesh, in Cox’s Bazar, Bangladesh, Aug. 28, 2017. The unrest has exposed the dark side of Myanmar’s historic opening: an unleashing of ethnic hatred that was suppressed during 49 years of strict military rule that ended when the generals stepped back from direct rule in 2011. The following year, hundreds of people, most of them Rohingya, were killed in communal clashes in Rakhine state and about 140,000 people were displaced. In neighboring Bangladesh on Monday, border guards tried to push back refugees stranded in no man's land near the village of Gumdhum. Reuters reporters have heard gun fire from the Myanmar side in the last three days. A Bangladesh foreign ministry official told reporters Bangladesh was willing to work with Myanmar to crack down on the insurgents. "The main purpose is to ensure Myanmar can't accuse us of harboring them to use against them," said the official, who was not authorized to speak publicly to media. An Islamist group called the Arakan Rohingya Salvation Army, which Myanmar has declared a terrorist organization, claimed responsibility for the Friday attacks. It was also behind the violence in October. In a video posted online on Monday, ARSA leader Ata Ullah, flanked by two gun-toting men in masks, warned Myanmar against "oppressing" Rohingya and vowed to keep fighting to protect the rights of the community. Rohingya have been fleeing Myanmar since the early 1990s and there are now about 400,000 in Bangladesh, which has said no new refugees will be allowed in. Bangladeshi police threatened refugees already in the country with arrest if they help new arrivals, refugee sources said. "How can we go back there? Just to get killed?" asked Mujibur Rahman, standing on the border. Nevertheless, an estimated 5,000 people have crossed into Bangladesh in the past few days, with more than 1,000 coming early on Monday, according to Rohingya refugees in camps in the border district of Cox's Bazar. Myanmar has urged Rohingya civilians to cooperate with security forces, assuring those with without ties to the insurgents they would not be affected. The government has evacuated thousands of non-Muslim villagers from the north of Rakhine state to towns, monasteries and police stations. About 500 people arrived in the state capital, Sittwe, on Monday, the government said. "A lot of Kalar were coming and we had to run away," said Nyo Win, 52, using a racial slur for Rohingya. "They followed us and we ran and ran."